Quite a treat to get a fleeting glimpse of him, (a first for me). Quite a lot smaller than expected, at 23-28cm long, wingspan 38 to 45cm. he was also quite sprightly before quickly disappearing again. Maybe next time (if I am lucky) might see him in the water or even better in the air. 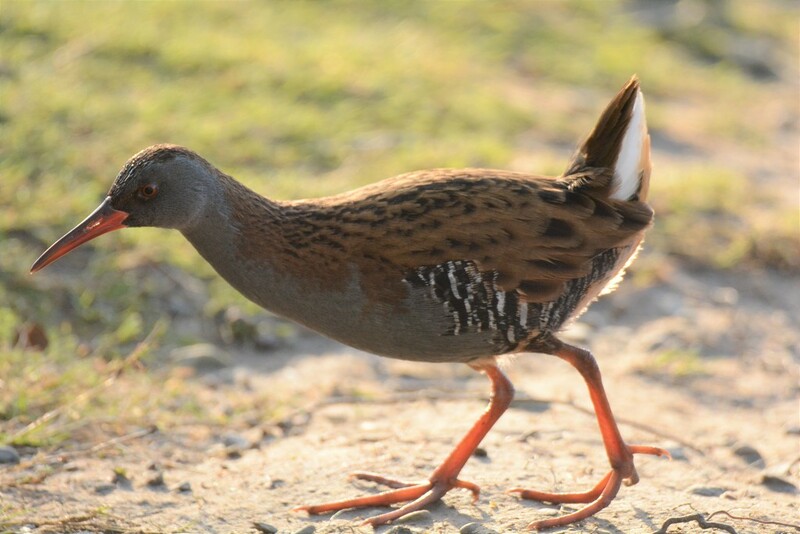 The Water Rail, is quite common but also a highly secretive inhabitant of freshwater wetlands and are still far more often heard than seen............. Look at the size of those feet. An incredible capture. 365 is the best bird Audubon sight! He’s really cool looking and I have never seen or even heard of his breed till now. Nice capture. Always such fun to capture one of those elusive birds. A stunning shot of this lovely bird, fav! How exciting to see one, so rare these days. You are becoming quite the birder. This is a great shot of this unusual looking bird. I've never seen one out in the open like this! Great shot. Oh wow, I've never hear of this. Fantastic close up! Love those orange legs. Wonderful capture - Always love looking at the toes. What size of shoes does he wear - his feet look very big for his body. A marvellous capture. Fav.